Caregiving from a Buddhist perspective is a recognition that this person’s suffering is also my suffering. When I see that, whether I’m the person in the bed or the person making the bed, I have to confront this precariousness. Mindfulness practice can help us enormously in continuing to give our attention to what’s actually appearing, as opposed to being swept away by the drama of the process. 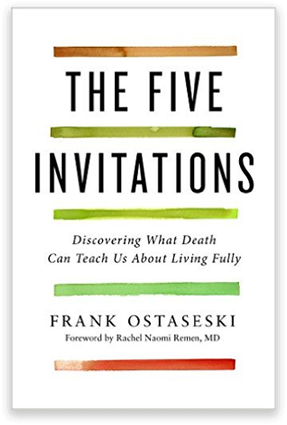 What are the basic attitudes that might be helpful in being with someone who is dying? One of those that comes to mind is to be completely ourselves. That means to bring our strength and vulnerability to the bedside. And to recognize that people who are dying continue to need very intimate and natural and honest relationships. We can’t serve from a distance, this is intimate work and we have to be part of the equation So it is absolutely essential that we bring our entire selves to the experience. It’s important that we bring to the bedside the quality of empathy. This is maybe the greatest gift we can give another human being—our undivided attention. To listen without judgement or agendas. The great psychologist Carl Rogers once described empathy as “… looking with fresh and unfrightened eyes.” I think that’s a wonderful way of thinking about how to be with someone. Part of my task is to try to take ancient Buddhist practices and make them useful and accessible to people who are not experienced with it; to use language that doesn’t create more barriers. There’s a lot of talk out there about conscious dying. But we don’t speak so much about conscious care giving. In dying, spiritual support is every bit as important as good pain control. But we rarely extend that kind of support in a meaningful way. And as a result, too many people are dying in distress and in fear. WE can do something about that. So what is it to provide this support? I would say first and foremost, it’s about bearing witness. And that means not turning away when the going gets rough, staying present in the territory of mystery and unanswerable questions. Sometimes, depending on the a person’s tradition, it means calling a priest to give last rites, or getting a prayer shawl, or helping to write letters of reconciliation. Rarely is it a matter of conducting existential discussions. Or even introducing formal practices. It’s helping people to face directly what’s occurring, to work with the paradoxes that they’re confronted with. Probably most important, is to become aware of our own bodies and minds. Let’s not underestimate this. It’s the most essential of all practices—one’s commitment to maintain awareness of one’s own mind, body and heart in the middle of this. When we are caring for someone who is sick, we lend them our body. We use the strength of our arms to move them from the bed to the commode, and we can also lend them the strength of our mind. We can help to create a calm and fearlessly receptive environment. If there is one person in the room who is calm—just one person—it eases the entire experience for everybody.